This is a new project by Claudio Milano, mastermind of avant-prog band Nichelodeon who together with Erna Frassens (aka Kasjanoova) created an album entitled “Adython” which is divided in two long tracks that make a total time of 47 minutes. Here, they offer a record that is not easy to label, and actually, not so easy to dig because of its experimental, and if you want, quirky sound shared mainly by Milano’s vocals. “L’oracolo di delfi” is the first track, with 15-minute duration. Since the first seconds we will listen to Milano’s vocals making some strange noises, that at the same time let us know he reaches high notes. It wouldn’t be a lie to say that the name of Demetrio Stratos came to my mind, mostly his solo work (the album Cantare la voce) and I assume Claudio has been inspired by him, among others. It is necessary to mention that the voice is not the only element here; we also have the lyrics, written by Frassens, and the electronic and computer noises that help creating atmospheres, nuances and textures. The musical side is not the only one can appreciate here, because the vocals make an excellent work that let us also see the theatrical side, which at the same time, produces different emotions and images. In moments, the sound becomes nervous, even disturbing, which is great, because it means the music is touching you. After ten minutes there is a passage I like a lot, with tension created by the electronics, while the voice keeps sharing the lyrics, giving the precise entonation to those words. “Adython” is the second and last track of the album, but it is really long surpassing the 30 minutes. Here they offer practically the same, I mean, experimental vocals accompanied by electronics that make backgrounds and weird noises, and also lyrics that produce something in the listener, without even knowing Italian. A wonderful decision here, was the addition of a saxophone, because it gives cadency and produce a kind of jazzy sound. The song flows, creating different passages where the vocals keep making that theatrical tune, sometimes clean, and sometimes modified by the lap effects. I like when the vocals are modified because it seems it is another character of the imaginary story, hope you get me. At minute twelve is more evident the reminiscence of Demetrio Stratos, it is good how Claudio Milano let his voice do what it wants and play whatever it wishes. The background effects are constantly changing, putting a diversity of noises that maintain this nervous atmosphere. And the song flows, until the very end, creating a great communion between voice, lyrics, sax and electronics. As I said, this album is not that easy to dig, however, once you allow it you will surely like it just as I did. A very good experimental, avant-garde album! 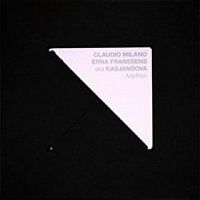 Claudio Milano is best known for his avant-garde group Nichelodeon, which has thus far put out 2 CDs and one DVD. Milano is a busy bee even outside Nichelodeon, which he proves with another collaboration, this time with Erna Franssens aka Kasjanoova and their joint album Adython. Erna was in charge of the concept and lyrics, while Milano let loose in the vocal department. The two are joined by a few sound manipulators on computer and laptop and a saxophone player. Some of the descriptions that could best fit this album would be Musique concrète, noise and even sound destruction. Think of some of Faust's efforts, but this time played on laptops and heavy on the vocals, which Milano tackles extremely skilfully and professionally, to be honest. Scattered among the laptop effects and Milano's vocal heroics are some jazzy saxes, which do add some flair to the proceedings and shake things up a bit, but mostly we have to be content with following Milano's semi-operatic vocals, which are truly out of this world. If you’re a fan of music more based in melody, this won’t be an easy experience. I found myself struggling to find anything firm to grasp onto in terms of concrete ideas. I do appreciate that this project tries to search outside the boundaries of known music, but I would have preferred something with a bit more focus and deliberation. Milano’s vocal manipulations and acrobatics are as good as ever and are remarkable, to say the least. The album is worth it just to hear Milano’s talents, for which one could almost say that they equal Demetrio Stratos’ in stature. I don't really think this is anywhere nearly in the same league as what Claudio Milano is doing with Nichelodeon, but fans of highly experimental, almost noise music will appreciate what he is doing in this partnership with Erna Franssens – searching beyond the comfort zone and almost trying to invent a new musical language. Almost too avant-garde and “out there” even for my tastes.